The Nursing Home Ombudsman Agency of the Bluegrass received a grant from the Kentucky Colonels on September 22, 2017 in the amount of $1,225 to print updated Certified Ombudsman Training Manuals. The Nursing Home Ombudsman Agency is a non-profit agency that advocates for residents living long-term care facilities, including nursing homes, personal care homes, and family care homes. Our Certified Ombudsmen receive 24 hours of initial training and more than 12 hours of continuing education every year. These new training manuals will allow our Certified Ombudsmen to continue to provide excellent advocacy services to the residents in the 17 counties of the Bluegrass Area Development District. 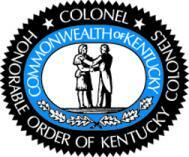 The Kentucky Colonels is an organization of talented and capable men and women appointed by the Governor because of their citizenship and service. Their primary objective is to support Kentucky organizations who stand ready to help our citizens everywhere. The Kentucky Colonels, through their Good Works Program, distributed $1.5 million to support 171 worthy causes this year, which will impact over 3 million people across the state. NHOA would like to thank the Kentucky Colonels for their continued support of our mission to improve the quality of care for residents living in long-term care!